The first notes of the penny whistle drift lazily through the early morning – slowly coaxing me from the restless dreams I inhabit. It takes me a moment or two to realise where I am. I switch on my head torch and start my morning ritual: finding my clothes for the day, getting dressed, and packing away my sleep wear and other bits and pieces before I unzip my tent and brace myself for the first breath of cold morning air. I find my shoes and take the first big gulp of air. The cobwebs of sleep instantly disappear. On the horizon the night is slowly dissolving, while the head torch lights of my fellow hikers flit about like fireflies. On this particular morning I hasten to pull on an extra fleece, my beanie, scarf and gloves. The bite in the air is particularly vicious. Our campsite for the night sits close to a stream and I cannot wait for the first rays of the sun to warm my bones. 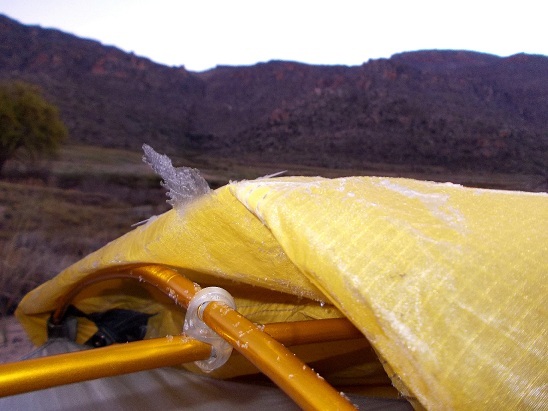 As I start to take my tent down I discover a thin layer of ice covering it. I temporarily give up on the task and stumble towards the voices, gathering in the distance, for the warmth of a cup of coffee. It is the morning of the fourth day of hiking on the Rim of Africa trail on the Southern tip of Africa. I came to immerse myself in a different consciousness for ten full days of hiking. 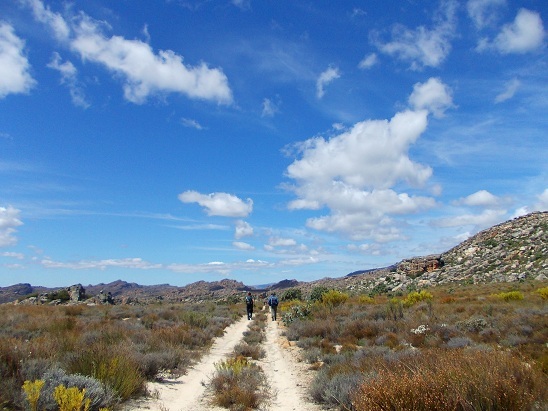 We started at the Pakhuis Pass in the Cederberg Mountains, walking south along the contours of the Cape Fold Mountains until we reach Turret Peak, which will signal the end of the second stage of what is envisioned as an epic hiking trail. This trail will eventually link all the Cape mountains, and when completed, will take 48 days to hike and will stretch all the way to the Outeniqua Mountains in the Garden Route. Founded by Ivan Groenhof and Galeo Saintz, it aims at putting South Africa on the map as a destination for mega-distance trails. Working with different stakeholders that include the state, private landowners and various communities, the idea is to create a 650 km mountain corridor with the trail snaking through it like a life-giving vein. The Rim of Africa hike is described as a “trail of no ordinary proportion”. It is much more than just a hike, as it facilitates an inner journey that is on par with the breathtaking beauty of the outer journey. Transformation is one of the core values of this hike and it takes on the feel of a rite of passage or a pilgrimage. Each day allow for time to walk in quiet, reflective mode and the male guides all have wonderful poems, thoughts or suggestions to enhance this special time. What I find interesting is that I have trouble reflecting during these quiet walks, as it requires thinking. How often have I not yearned in the busy-ness of life to stretch out those pauses between thoughts into a space of pure quiet! Yet, in this mountain space, those pauses come naturally and stretch not only into a suspension of thinking, but also into an inhabiting of a calmness and peacefulness that links my soul to that of a larger, expansive earth energy. Here, in this wilderness, I feel connected and grounded. As if I, at last, discovered my true self without all the trappings of personality, duty or emotions. Celebrating the beautiful rain-free weather! During my ten days in the mountain wilderness I could forget about the world I normally inhabit and walk through a physical and mental space that was expansive, sheltering, challenging and comforting, in equal measure. The rhythm of each day flowing quietly into the next, distorted my experience of time as measured by clocks and watches, and dropped me into a dimension where the rising and setting of the sun set the pace of my heartbeat. As I walk through my life, I will remember with fondness and appreciation the beauty of the space, the generosity and love of the people I shared it with, the valuable lessons I learned, and the joy of my soul bathing in the challenge and delight of this special experience. 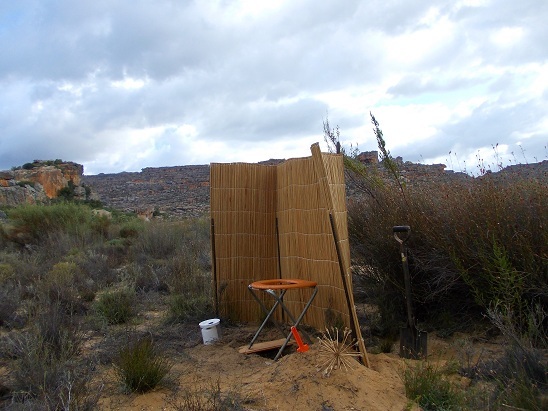 . .
A Loo with a View – every night we had a quirky spot for one of life’s necessities. ** A Note of Appreciation: The photographs are courtesy of fellow-hiker Debbie Schouw, who, not only was a fun companion, but has a keen eye for spotting the unusual and beautiful. Thanks Debs! Pretty rugged out there in those dream-time mountains. 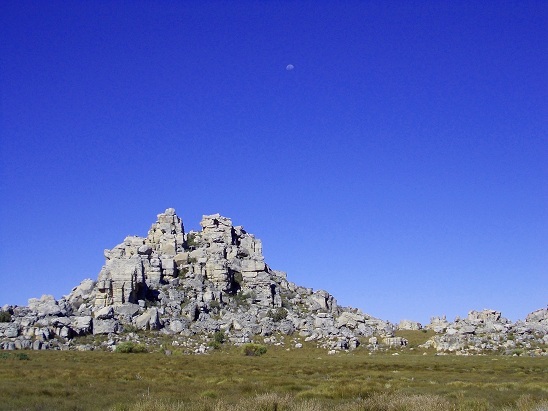 I hadn’t heard if this hike, although I know athe Pakhuis area in the Cedarberg. There’s a sense of timelessness – I enjoyed reading your experience. Thanks for the link, Jolandi. That will be one awesome trail to tackle.